Stainless steel looks great, but it can be a little bit tricky to keep clean and when we let it go a little too long…..we might end up with some of those nasty hard water stains! No big deal. Let’s just give it a polish and it will look as good as new. Right? Ehh, not so fast! 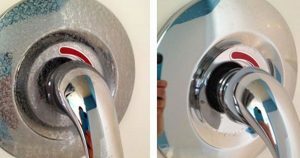 You can’t always polish hard water stains with regular polish, nor should you. You don’t want to scrub super hard and scratch the stainless steel. So, what should you use to get rid of those nasty hard warder stains? The good thing about this little project is we will only need two products! That’s right, just two. Wipe the stainless to ensure there is no dust/dirt on the surface you plan on cleaning. Spray Bar Keepers Friend on the surface and let it soak for 2-5 minutes. Grab one of your magic erasers and scrub the surface. Note: If you are cleaning stainless steel with grain, you will want to scrub with the grain and not against it. This ensures you will not pick anything up on your sponge and scratch the surface. If the hard water stains are still showing, you can repeat this step again. Let the bar keepers friend sit on the surface for a few extra minutes to give it time to break up the hard water and then scrub again with your magic eraser. Buff out the access bar keepers friend on your surface and your stainless steel should look new again! Hopefully you found this article helpful. We are passionate about house cleaning and try to share tips that will help you keep your home looking new!